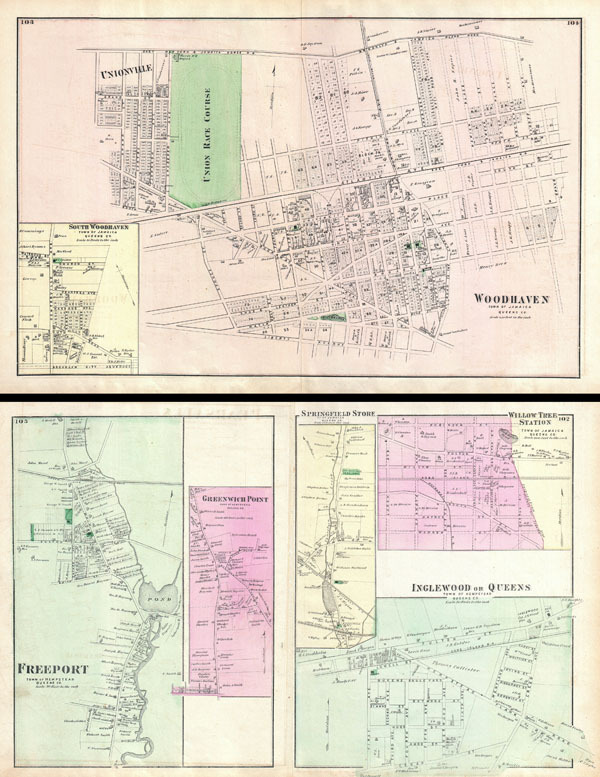 Woodhaven, Town of Jamaica, Queens Co. / Freeport, Townof Hempstead, Queens Co. / Inglewood or Queens, TownofHempstead, Queens Co.
A scarce example of Fredrick W. Beers' map of the town of Woodhaven, Queens, New York City. Published in 1873. Covers from Unionville past the Union Race Course along Atlantic Avenue to Grand Street. Extends as far south as Liberty Avenue and as far north as the Jamaica Plank Road. Lower left quadrant features an inset plan of South Woodhaven. Verso features city plans of Freeport, Greenwich Point, Springfield Store, Willow Tree Station and Inglewood. Detailed to the level of individual buildings and properties with land owners noted. This is probably the finest atlas map of the town of Woodhaven, Queens, to appear in the 19th century. Prepared by Beers, Comstock & Cline out of their office at 36 Vesey Street, New York City, for inclusion in the first published atlas of Long Island, the 1873 issue of Atlas of Long Island, New York. Very good condition. Original centerfold. Maps of Freeport, Greenwich Point, Springfield Store, Willow Tree, and Inglewood on verso. New York Public Library, Map Division, 1527301.